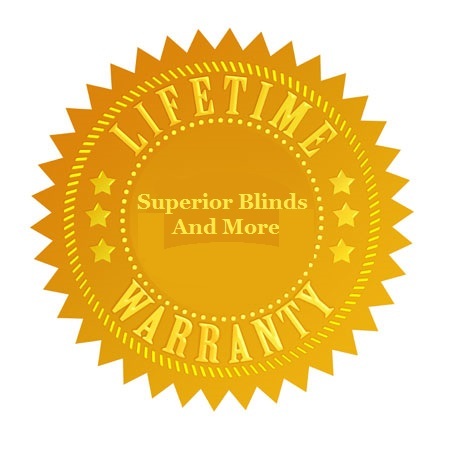 Your investment in Superior Blinds And More products is backed by a Lifetime Limited Warranty. These industry-leading warranties serve as our written pledge of lifelong quality and performance. Superior Blinds And More is no longer the manufacturer of ANY products it sells. The low cost of stock China products has made it unnecessary to compete. We currently are retailers for much larger operations. Each manufacturer we sell carries their own warranty. Normal warranty’s are 3 years to a lifetime, depending on the product. All fabrics, PVC, and wood material will lose color intensity after exposure to the sun. Blinds that are composed of natural wood products may warp and are not recommended for bathrooms, kitchens or other areas with high humidity. Cords may eventually fray or break and such conditions are considered the result of normal wear and tear. There may be variations in color, grain texture and slight warping from slat to slat. These are natural characteristics of the material and are not considered defects. PVC vanes top hole punch may and possible will break over time due to normal wear and tear and is NOT covered by ANY warranty. Vane savers may be purchased to repair the problem for as little as $1 per clip. Shutter defects have a three (3) foot rule. Moreover, if the defect is noticeable farther than 3 feet from the shutter it is construed to be defective and hence obvious. The exclusive warranty obligation of Superior Blinds And More is to repair or replace blinds or components thereof, as Superior Blinds And More shall deem appropriate. In no event shall Superior Blinds And More be liable for the incidental or consequential damages or for any other direct or indirect damage, loss, cost or expense. Buyer shall bear all expenses associated with de-installing, measuring, shipping, re-shipping and re-installing blinds subject to warranty. 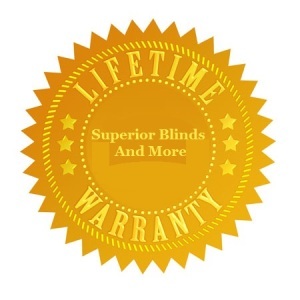 Buyer shall pay $50.00 service charge to Superior Blinds And More for any warranty service requested later than three years after the date of original installation. THIS WARRANTY IS EXCLUSIVE AND IN LIEU OF ALL OTHER EXPRESS AND IMPLIED WARRANTIES, INCLUDING ANY WARRANTY OF FITNESS OR MERCHANTABILITY, AND ALL OTHER OBLIGATIONS AND LIABILITIES. If Buyer intends to make a warranty claim, Buyer shall (1) notify Superior Blinds And More of the details of such claim, (2) if the request for repair or replacement is covered by this warranty, obtain from Superior Blinds And More a return authorization number which Buyer shall thereafter use to identify all products and communications referring to the requested warranty service, and (3) furnish a copy of this Warranty Certificate to Superior Blinds And More. Buyer must present original invoice of defective product to ascertain purchase was made.